There is a curious paradox in the job market. On the one hand, we are bombarded with dire predictions of jobs lost to robots, artificial intelligence (AI), and automation. On the other hand, employers in fields like manufacturing and construction — those very fields where job loss is predicted as more dramatic and imminent — are finding it impossible to hire enough skilled workers. What is going on? Gloomy predictions of industrial-scale automation and widespread joblessness abound: An oft-cited Oxford University study warns that 47 percent of US jobs will be automated within the next twenty years; pundits warn that truck drivers will soon be displaced by autonomous-driving trucks and that AI will replace radiologists, paralegals, and a host of other white-collar occupations while robots take over factory floors and construction sites. Yet the US economy today employs 9 million people more than at the previous peak of employment before the great recession; and while economists Autor and Restrepo estimate that up to 670,000 US jobs have been replaced by robots between 1993 and 2007, over that same period the economy created forty times as many jobs. Even more striking is that we are experiencing labor shortages in those same job categories seen at highest risk of automation. The trucking industry needs an additional 50,000 drivers to cope with the increased traffic volume — and cannot find them. In a range of industries, large cohorts of experienced workers are set to retire in the coming years, without an adequate pipeline of younger workers ready to replace them. A 2015 study by Deloitte and the Manufacturing Institute estimated this will create a gap of 2.7 million jobs in manufacturing alone — and that 2 million will remain unfilled because of lack of qualified workers. In the construction sector, over 80 percent of members of the National Association of Home Builders rank availability of labor among their top concerns. Increasingly dire predictions of mass unemployment clash against mounting evidence of labor shortages. Why is this? There is little doubt in our minds that automation will have a profound and disruptive impact across industries and on the workforce. But overhyped fear of automation is backfiring, exacerbating the problem today and making it even harder to identify the right solutions for tomorrow. First, the impact of technology is slower to take effect than the hype suggests. The more disruptive the innovation, the harder it is to implement it, especially in industrial contexts. Tesla’s difficulty in meeting Model 3 production target has been caused in part by an overly ambitious automation effort. Companies need time to invest in the new technologies and adapt their operations and managerial practices. This also helps explain another paradox, namely the sluggish pace of productivity growth compared to the hype of digital-industrial innovations. Second, young people are being discouraged from careers in manufacturing and construction by a distorted perception of the present and an exaggerated fear of the future. 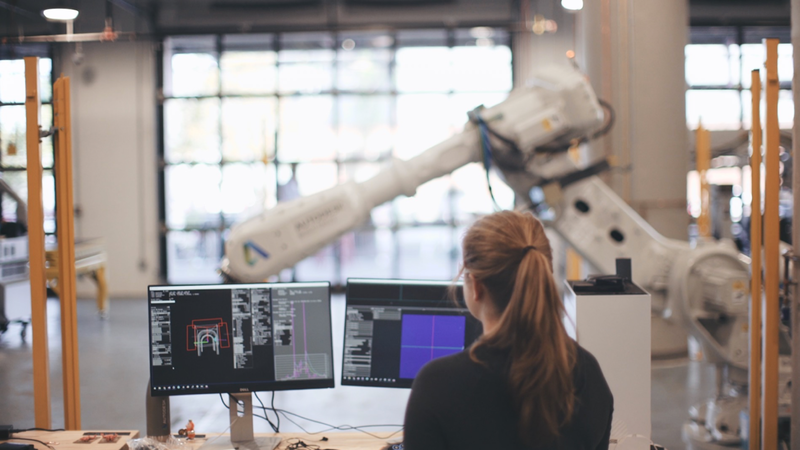 Manufacturing and construction jobs are often still thought of as dirty, dangerous and low tech: who would want to train for them, especially when being told that they will soon be automated away? This view is both misguided and counterproductive. The technological content of manufacturing and construction jobs has ramped up significantly over the past decade. Digital-industrial innovation will make these jobs even more advanced, with 3D printing machines, generative design, augmented-reality wearable devices, and AI-driven processes. Manufacturing is already high tech and construction is not far behind. Third, the skills needed today will not disappear. They will become the building blocks on which workers will build more advanced abilities as they learn to collaborate with more sophisticated technologies. This point bears repeating: Most jobs in industry will not disappear. They will evolve and become more sophisticated — providing long, rewarding, and well-paid careers. Technology itself will provide tools for easier, just-in-time training and learning. More and more workers to fill these jobs will be sorely needed. We face a massive growth in demand for housing, infrastructure, goods, and services. Simply to house global population growth, we will need to build 13,000 new buildings a day. We need to build the infrastructure to bring energy and health-care services to the scores of people still left out across the world; over 1 billion people still lack access to electricity, for example. The infrastructure in advanced economies needs to be modernized. Every day, 400,000 more people join the global middle class: They desire and deserve a better standard of living. To service this demand, we need both automation and more workers. We need a new model of human-machine collaboration that allows us to do more with less, to lift global living standards while lightening our resource footprint. Companies will have to invest in upgrading workers’ skills: Very few production lines can be entirely automated, and most firms will reach maximum efficiency and profitability only by investing in both technology and human capital. Mastering today’s manufacturing and construction skills can open for young workers a path to a challenging and rewarding career. If entrants into the labor force continue to shy away from industry, conversely, US companies will struggle to keep up with global competitors, losing market share — and those job opportunities will be gone for good, not because of the robots, but ironically because of a lack of skilled workers. To meet the rising global demand for better living standards, we will need both more workers and more robots, in a new and better human-machine collaboration to create more with less.